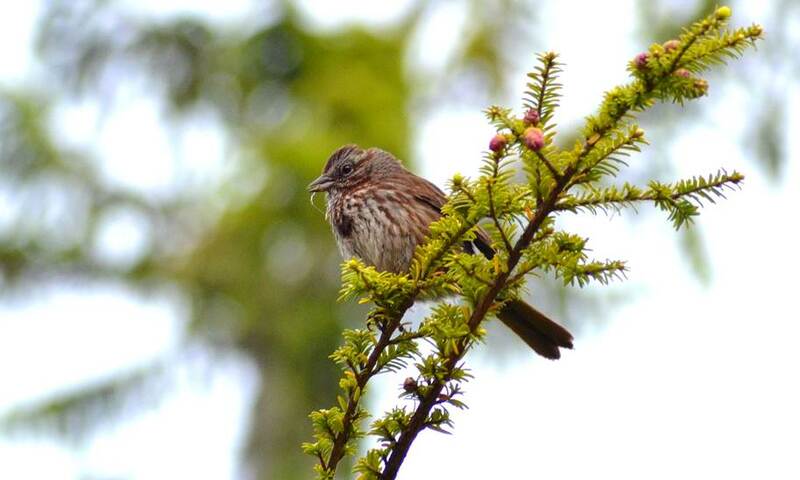 Song sparrows in spruce and western hemlock trees. Photos by Josh Silberg (left) and Christian Kelly. The song sparrow is a medium-sized sparrow with a rounded, bulky shape, a relatively round head, and a short beak. Its colouring is streaked brown, white, and grey. There are different subspecies that vary in shade and streaking, though all have a wide greyish eyebrow, a wide brown stripe swooping down from either side of the beak (malar stripe), a brown or browny-red streaked back, and a light front streaked with brown. Often the front streaking will converge to form a central breast spot, though this trait generally isn't found in the Pacific Northwest. 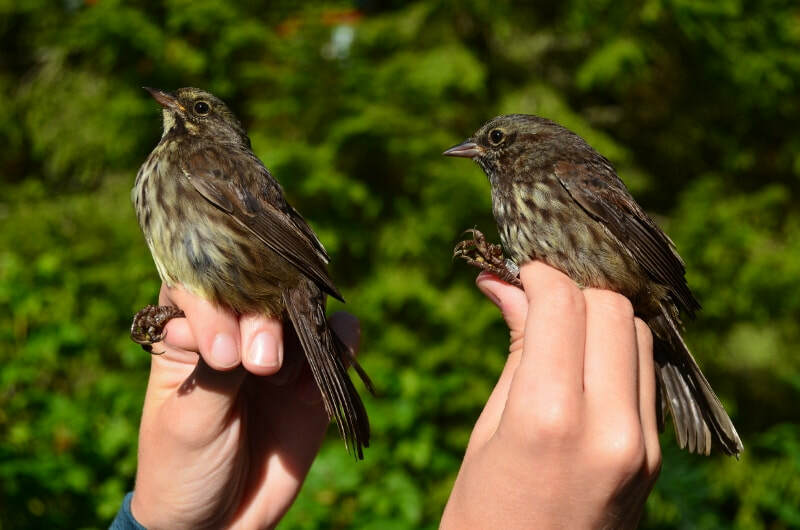 Coastal and northern subspecies, like those found on the central coast of BC, are generally darker and streakier. To identify a song sparrow in flight, look for a downward pumping movement in the tail. 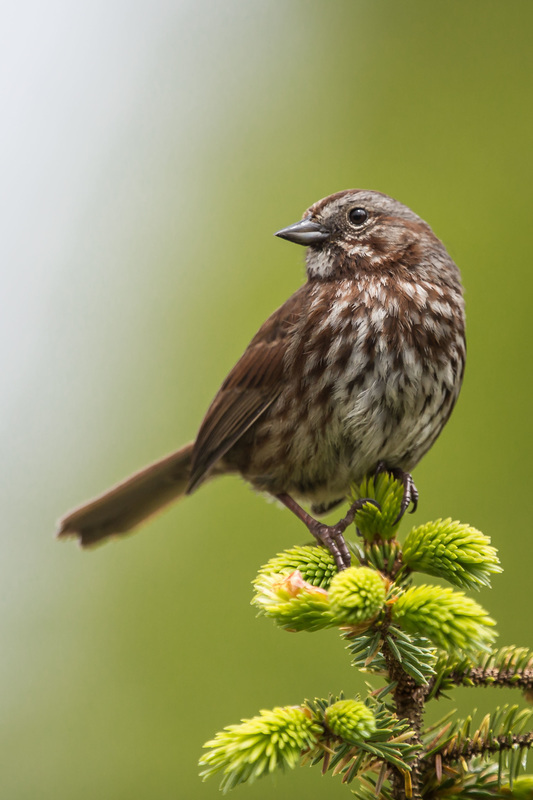 The song sparrow is frequently found in open habitats — including backyards — as well as along forest edges, near wet areas like marshes, and hopping around low-lying vegetation. Males can be quite conspicuous as they sing from branches, especially in spring and summer. This bird can be found on the Central Coast throughout the year: its year-round range stretches along most of the west coast, and extends into parts of the United States. It is found across much of Canada and some northern states during summer breeding months, and it winters in the southern US. The dark spot sometimes found on the streaked breast of a song sparrow is also found on some other sparrow so should not be used as a major ID feature. Sparrows with similar colouring are the vesper sparrow (which has a white eyering), the savannah sparrow (yellow-tinged around the eyes), Lincoln's sparrow (darker eye stripes and buff-coloured throat stripes), and the fox sparrow (larger, darker, and redder overall). Click here for a detailed description of differences between these species. There are 24 recognized song sparrow subspecies. The darker plumage found in areas like the Central Coast is caused by an increase in the pigment melanin, and may be a defense against mites and other such things that can cause decay in wet environments. Melanin makes the feathers tougher and more durable against degradation. Dunn, J. L. and Alderfer, J. (Eds.). (1999). National Geographic Field Guide to the Birds of North America. (3rd Ed.). Washington, D.C.: National Geographic Society. Pp. 414. Song sparrow. The Birds of North America Online (A. Poole, Ed.). Ithaca: Cornell Lab of Ornithology. Retrieved from the Birds of North America Online. Accessed 04/07/2013.